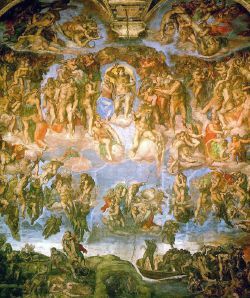 The Last Judgement - Fresco in the Sistine Chapel by Michelangelo. Eschatology (from the Greek έσχατος, "last, ultimate, end" and logy, teaching), simply translated as “discourse about the last things,” generally reflects the quest for an ultimate human purpose on the individual and the cosmic levels. The driving force of seeking answers to such a twofold human purpose is confirmed by the two major themes of eschatological inquiry, namely, life after death and the final stage of the world. On the level of the purpose for the individual, it is the end of physical human life that raises the question of a personal life after death (individual survival of consciousness) and the conditions of such an extended existence, questions that are discussed in individual eschatology. Furthermore, on the level of the purpose for the whole of existence, speculations about the future state of humanity developed into a body of doctrine known as universal eschatology that seeks to explain the end of the world and its relevance to the Last Days in the history of the world or the ultimate destiny of humankind. This cosmic or social goal (telos) of history is unique for the Western approach to eschatology. On a more comprehensive level, individual eschatology discusses the last things of one's personal life such as death, the afterlife with its experience of reward and punishment, and the reality of the human spirit or soul. By contrast, universal eschatology addresses issues of a cosmic dimension, in particular the concepts of the Advent of a savior figure, the final confrontation between the forces of good versus evil and the establishment of a realm of deliverance from suffering and sin based on the restoration of an original world of goodness. One needs to point out that teachings about the end of the world refer not just to a time of decline, suffering and destruction, but more importantly they emphasize the hope for the perfection of the individual and the completion of the created order. In many religions, the end of the world is a future event prophesied in sacred texts or folklore. By analyzing the use of the Greek word “aion,” meaning “age,” some translations of sacred texts may read “end of the age” instead of “end of the world.” This distinction leads to a theological insight, for the “end times” in many religions may involve the destruction of the planet (or of all life), however, by affirming the survival of the human race in some new form, it makes sense to speak of ending the current “age” and beginning a new one. The origin of eschatological teachings on the individual level can be traced back to the earliest strata of human existence. Archaeological records of customs in the Old Stone Age (older than 13,000 B.C.E.) confirm a simple understanding of immortality. The concept of a human spirit that exists beyond physical death appears to be the starting point for primitive, individual eschatology. With the advancement of civilizations and the development of religious consciousness, standards of good and evil were introduced which prompted the association of the laws of retribution with the life of the spirit beyond life on earth. Thus, the future life understood as spiritual existence assumed the timeless identity of a moral life as it is confirmed in ancient Egyptian eschatology. Likewise, the early Persian and Hebrew conception of a shadowy existence after death (the underworld, Sheol) was further developed into a personal after life that included moral distinctions with places for reward (heaven) and punishment (hell). Furthermore, the individual eschatology of the ancient Greeks holds the belief in a pre-existent spiritual life based on the concept that the mind consists of a purely spiritual essence that has neither a beginning nor an end. In other words, while affirming a concrete personal existence after death, the Greeks also believed in an eternal existence before birth. Throughout history, speculations about the future were not limited to the life of the individual, in particular when natural disasters such as earthquakes, volcanic eruptions, and floods pointed at the possibility of the "end of the world." Pacific islanders and American Indians shared the vision of a coming destruction of the world by fire or flood that might well have originated from some past terrifying experience. Beyond these early accounts of the end of the world, there emerges the question of how to evaluate scriptural accounts of the world’s religions that address issues of both individual and universal eschatology. As a start, one needs to be reminded that for Greek and Indian thinkers, history moves in cycles. Parallel to the yearly cycles of the seasons, all events are seen as occurring within a repetitive sequence of distinct time periods. In particular, this mode of thinking applies to questions of destiny on the individual and cosmic levels as stated in sacred texts from the Indian subcontinent. Based on a cyclical perception of time, some cultures, like India, also affirm an individual spiritual life, but minimize its existence after death through the doctrine of reincarnation, where the spirit enters another physical body immediately after death. This transmigration of the spirit (metempsychosis) follows a strict law of moral justice known as Karma in which one’s actions in this earthly life determine the quality of rebirth in future lives. In order to receive a good Karma, Hindu devotees need to follow the path of dharma, one’s religious and social duties that are rooted in righteousness and faith. However, when compromising the path of dharma through self centered thoughts and actions, human beings enter a state of bad Karma that can only be removed by means of being reborn into a lower life (that could be a lower caste or even a form of animal life). The resulting ongoing circle of births and deaths (samsara) perpetuates a state of suffering and ultimately appears as an evil from which human beings seek deliverance (moksha) in order to enter a state of absolute bliss and enlightenment (Nirvana). In Hinduism, cosmic eschatology is also understood within the framework of a cyclical perception of time. The Purana writings (recalling old tales about the Vedic period) mention cycles of creation and destruction within each of the “days” (kalpa) of the creator god Brahma that extend over a time span of over 4.3 billion earthly years. That is to say, during each of these kalpa “days” Brahma brings forth the entire universe (creation) and withdraws it into himself (destruction), thus implying a periodic recreation of the world with a new “Manu” or primeval man. Within the vision of a universal destiny for humankind, the notion of a Golden Age (krta yuga), extends for a time period of about 1.7 million earthly years starting in the far distant future with the arrival of the Kalki Avatar, the one of divine descent. "The Lord shall manifest Himself as the Kalki Avatar…He will establish righteousness upon the earth and the minds of the people will become as pure as crystal…As a result, the Sat or Krta Yuga (golden age) will be established." By contrast, the present age, the Kali Yuga, is the worst of all possible ages, "When deceit falsehood, lethargy, sleepiness, violence, despondency, grief, delusion, fear, and poverty prevail … when men, filled with conceit, consider themselves equal with the Brahmins.” The Kali Yuga began around 3000 B.C.E. and will last another 429 000 earthly years within the previously mentioned cyclical conception of time. Both Theravada (the way of the elders) and the later Mahayana Buddhism (the greater vehicle) address issues surrounding individual eschatology. Generally speaking, Theravada Buddhists claim to preserve Buddhism in its original form, taking a more conservative stance and emphasizing the practical aspects of Sakyamuni’s teachings (Sakyamuni is a title used for Siddhartha Gautama). However, Mahayana doctrine differs in having a general trend of being more speculative and free to develop new teachings, in particular with regard to life in the spirit after physical death. A case in point is the Mahayana doctrine of the three bodies (trikaya) that describe the experience of someone who attains buddhahood. In short, human beings in their developed spiritual state have an Appearance Body (or Transformation Body) within the physical realm, a Heavenly Body (the Body of Bliss) presiding over a Buddha realm in the heavens and the Dharma Body, the absolute essence of the universe that supports the other two bodies. By connecting the earthly Buddha with the Dharma Body or Absolute, Mahayana Buddhism points towards a personal relation between a saintly human being and the Absolute as found in theistic religions, in contrast to the Theravada Buddhists who perceive human life in more practical terms placing it in a universe that is less personalized. The three body teaching in Mahayana Buddhism then functions as the foundation for the development of the bodhisattva doctrine (referring to a being that is on the way to enlightenment) that describes the vision for a fulfilled individual destiny. In general, Buddhism accepts the Hindu teachings of reincarnation based on the law of Karma. However, the unique Buddhist position on interpreting the Karmic law lies in the concept of merit transfer. Early Buddhism, now mainly represented by Theravada teachings, emphasized that good or bad karma (merit or demerit) is solely the result of individual conduct in one’s earthly life. Still, there is one exception that concerns the transfer of good merit for the benefit of one’s dead relatives or the welfare of all living beings. In particular, Theravada Buddhists believe that the bodhisattva (someone who is close to reaching buddhahood but has not yet fully entered it) with his store of good past merits is assisting others to advance on the right path. Mahayana Buddhism expanded this understanding of the bodhisattva, making it one of their major doctrines by affirming that the bodhisattvas share their merits with all beings. However, it needs to be pointed out that bodhisattvas on account of their spiritual advancement close to enlightenment are now reborn after their physical death in one of the heavens. As spiritual beings, they are ready to share their great merit with all human beings who ask for assistance. In fact, Mahayana cosmology accepts numerous bodhisattvas, each being assigned to a heavenly region from which they bestow merit to those who pray for help. Expressed differently, Mahayana individual eschatology envisions the destiny of human beings as the attainment of sainthood (enlightenment) in the spiritual world being free from any physical reincarnation and using their merit to lead others to such a liberated existence. Buddhist cosmic eschatology acknowledges its Hindu roots, with the belief in a cycle of creation and destruction. In fact, the Buddhist sacred text, the Sutra Pitaka (discourse basket) from the first century B.C.E., applies the cosmological cyclical thinking to the state of Buddhist spirituality in terms of decline and revival of Buddhist teachings. The historical Buddha (the enlightened one, Shakyamuni or Gautama) apparently predicted that his teachings would disappear after 500 years. According to the Sutra Pitaka, the "ten moral courses of conduct" will disappear and people will follow the ten amoral concepts of theft, violence, murder, lying, evil speaking, adultery, abusive and idle talk, covetousness and ill will, wanton greed, and perverted lust resulting in skyrocketing poverty and the end of the laws of true dharma (in Buddhist use the religious teachings about the ultimate order of things). During the Middle Ages, the span of time was expanded to 5,000 years. Commentators like Buddhaghosa predicted a step-by-step disappearance of the Buddha's teachings. During the first stage, arhats (worthy ones or saints, in Theravada Buddhism devotees who attain the ideal of spiritual perfection) would no longer appear in the world. Later, the content of the Buddha's true teachings would vanish, and only their form would be preserved. Finally, even the form of the dharma would no longer be remembered. During the final stage, the memory of the Buddha himself would vanish. Some time following this development a new Buddha known as Maitreya will arise to renew the teachings of Buddhism and rediscover the path to Nirvana. Here, Buddhist cosmic eschatology affirms the savior figure Maitreya who awaits his final rebirth as a bodhisattva now in the world, in order to lead human beings to the end of the wheel of rebirth (moksa or the termination of samsara) and to enter the new existence of nirvana, the unchanging eternal state of one’s spiritual quest. Even if ultimate salvation is here perceived as overcoming the cyclical mindset, one has to remember that the final state of nirvana does not refer to the final state of history but exists within the Buddhist cosmology of cycles of creation and destruction. Even if eschatological expectations play a minor role in contemporary Parsi thought, Zoroaster (Greek for Zarathustra, the original name from old Persian), the seventh century B.C.E. Persian prophet, defended a distinct eschatological vision by preaching a cosmic dualism of the battle between the god of light and the god of darkness. He spoke of the new age to come, also called the Good Kingdom by today’s Parsis, in which the powers of truth and goodness will prevail. When the hoped-for Good Kingdom did not arrive, Zoroastrianism focused on the fate of the individual after death, thus developing an individual eschatology based on the belief of a personal eternal existence of the soul and the confirmation of a universal moral order. Thus, a righteous soul is accepted into heaven, the abode of song, while wicked souls, especially demon worshipers, are punished in hell. There is also a limbo-like realm for souls who did not commit major crimes, but lack the needed spiritual merit to advance to heaven. On the fourth day after physical death, the soul meets its conscience and faces personal judgment. The good soul meets a beautiful maiden who shows the way to heaven. However, the evil soul has an opposite experience on the way to hell. It is interesting to notice that Zoroastrian thought does not support the view of an eternal punishment in hell but affirms a temporary sentence for wicked souls. Based on the above mentioned different conceptions of history as cyclical and linear, scholars are doubtful whether a genuine universal eschatology can be found outside Zoroastrianism (together with Mithraism) and Judaism, including Christianity and Islam (the Abrahamic Faiths). In the Hebrew Bible, only a few rather vague passages refer to a personal life after death and generally, topics of individual eschatology receive limited attention. Early Hebrew religion (before the Babylonian Exile, 538 B.C.E.) affirms the belief in the underground realm of Sheol where people survived for some time if they lived a good life before Yahweh. Rabbinic Judaism of the post exilic era developed the belief in the resurrection of the body that confirmed a continuity of the after life with life on earth. However, the condition of such a future life is determined by just rewards and punishments according to the quality of one’s life on earth, in order to uphold the universal moral order as affirmed in the Hebrew Scriptures. For both, Pre-Exilic and Post-Exilic Judaism, issues related to universal eschatology predominate. On the one hand, the early Hebrews understood their social destiny as primarily connected with Yahweh’s judgment because of the sins of the Israelites (according to the prophet Amos). On the other hand, there are frequent references to a future time when God will build his eternal reign of righteousness (Isaiah 11:1-9) and vindicate his people. However, before God’s reign arrives, humankind encounters the end of the world as described with the Jewish notion of “the end of days” (charity haymow) or the “Day of Yahweh.” One of the sages of the Talmud says that, "Let the end of days come, but may I not live to see them," because they will be filled with so much conflict and suffering. There will be tumultuous events overturning the old world order that culminates in a final great battle when Gog the king of Magog will attack Israel (Gog and the nation of Magog are not further known). This great battle, also called Armageddon, is the time when God will intervene, vanquishing this final enemy and saving the Jews. In fact, all evil powers will then be banished from human existence and a new order will be established in which God is universally recognized as the ruler over everyone and everything. Based on a linear view of history, the Talmud, in the tractate Avodah Zarah, states that this world as it is known will only exist for six thousand years and then enters a new eon. The Jewish calendar (luach) functions completely on the assumption that time begins at the Creation of the world by God in Genesis. Many people, notably Conservatives, Reform Jews, and some Christians, think that the years mentioned in the Torah, are symbolic, signifying extended periods of time. By contrast, ancient Jewish teachings adhered to by today's Orthodox Jews, see the biblical years as literal and consistent throughout all time, with about 365 actual days. After 6000 biblical years (applying to both the symbolic and the literal interpretation), the seventh millennium will be an era of holiness, tranquility, spiritual life, and worldwide peace, called the Olam Haba ("Future World"), where all people will know God directly. Post-Exilic teachings speak of God’s decision to bring an end to present history by sending his Messiah who will expel all evil and liberate the Jewish people from oppression by defeating Israel’s enemies. At some point, the Jewish Messiah, who will become the anointed King of Israel, will divide the Jews in Israel into their tribal portions in the land, thus restoring the original Davidic kingship. Later teachings affirm the gathering of the scattered Jewish people (the Diaspora) to the geographic Israel as the condition for the arrival of the Messianic age. Messianic expectations intensified when the Roman general Pompey the Great conquered Palestine in 63 B.C.E. The Jews longed for a liberator, their Messiah, a descendant from the line of David, who would shake off the Roman yoke and rule as a righteous king expanding the reign of God to all the nations. This desire can be understood as the major cause for the Jewish rebellion against the Romans in 66-70 C.E. that resulted in the destruction of Jerusalem and the Jewish Temple. From that time on the Jewish people had lost the unifying center of their religious life and dispersed throughout the known world, living in small communities that defined their existence in the diaspora. Temple worship and ritual were now replaced by religious communal life that centered on the synagogue, thus marking the development of Rabbinic Judaism. Jewish piety found now a new focus in the study of the Torah that included an ongoing effort of identifying Jewish eschatological expectation. 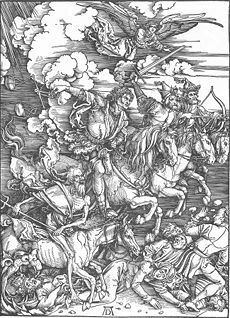 Four Horsemen of the Apocalypse, by Albrecht Dürer. Following their Jewish roots, Christians also affirm a linear view of history and understand the “last things” in terms of an ultimate goal for all existence that determines the unfolding of God’s providence. That is to say, individual and cosmic eschatology move towards a definite “end” within human history. From a Christian perspective, it is crucial to examine first the meaning of the term “end,” in order to determine its larger theological significance. It was Augustine, who distinguished two distinct meanings of "end." On the one hand, "end" signifies "the ceasing to be what is" leading to a literal interpretation of scriptural texts, implying the annihilation of existence that may involve the destruction of the planet, or of all living things. On the other hand, "end" describes "the perfecting of what was begun" emphasizing a different mode of interpretation that would point to the perfection of the created order. Here, the human race would survive in some new form, going through the "end of the age" leaving behind the current eon of a suffering and dysfunctional existence and beginning a new order that would manifest the original purpose of creation. Main line Christian eschatology affirms that latter meaning of “end” through interpreting its central eschatological doctrine of the Kingdom of God. For Christians, God’s Kingdom started with the incarnation of Jesus understood as God’s ultimate self-manifestation in the created realm. That is to say, God’s reign extends not just to the heavenly realm but it begins also on earth because of the historic Christ event. Jesus’ life and mission then inaugurate a process of eschatological fulfillment that moves between the temporal markers of “already,” referring to those parts of the church where community with Christ is established, and “not yet,” indicating the absence of Christ in the world and the church, also known as the “eschatological reserve.” As much as believers are determined to live a Christ centered life, they still experience a state of being held back or separated from the desired eschatological fulfillment. In short, the fullness of God’s reign is reserved for a future event, the end of the world, in which individual and cosmic eschatology will be completed. Still, throughout the centuries, Christianity developed its vision of individual eschatology in order to lead believers on their path of the imitatio Christi. The most prominent text in the New Testament that defines the vision of individual eschatological fulfillment is the Sermon on the Mount (Matthew 5). Here, human beings are called to develop the spiritual disposition of attempting consistently to follow Jesus’ message in their daily lives. Such a divine calling moves between the admonition to fulfill one’s personal responsibility and to receive God’s grace as the assurance of God’s acceptance despite human neediness and brokenness. Furthermore, Paul contributed to the eschatological vision of personal fulfillment by telling Christians that they can hope for experiencing a resurrection in which they would receive an imperishable, eternal spiritual body (1 Cor. 15:55). This vision was further developed by Origen who suggested that the resurrected body will have the same form as the physical body but it will consist of a different “matter” or spiritual substance. For Paul’s vision it is also important to affirm the salvation of the soul by means of “passing through fire.” In fact, Paul speaks of the destruction of everything in the life of a Christian that has not been founded on Christ (1 Cor.3:10-15), a notion that explains the symbolic meaning and purifying power of fire. Also, Clement of Alexandria and Origen developed the idea of a fire that would purge guilty souls. Christian individual eschatology affirms the immortality of the soul and a personal judgment after physical death when the righteous soul is united with God in heaven, whereas the sinful soul is assigned to the fires of hell. Roman Catholic doctrine describes this scenario in more detail by introducing purgatory, a spiritual realm where souls with venial sins undergo a cleansing punishment by fire in preparation for attaining the Beatific Vision, a state of ultimate oneness with God that will be only possible in the spiritual realm at the "end of the world." Catholics (and main line Christians) teach that souls with mortal sins end up in the eternal fires of hell, a doctrine that is also known as eternal damnation. The contrasting view on this matter is called Universalism that was already stated by Origen in his teaching of apocatastasis, the final restoration of all things. This means that all spiritual creatures, angels, demons, and human beings, will be saved, thus affirming a positive outcome of the cleansing of sinful spirits by fire as the final eschatological vision. The Revelation of John speaks of God wiping away all tears from human beings and death or sorrow would no longer exist (Rev.21:40). Even if the teaching of Universalism can claim biblical support, it was rejected by Augustine and formally condemned by the Christian church. As much as the Kingdom of God is supposed to reside within human beings and provide the vision for individual eschatology, at the same time it becomes the central paradigm for the renewed world order as it is explained in the Christian view of cosmic eschatology. It is important to understand the "end of the world" as a renewal of the world, resulting in the Kingdom of God, based on the aforementioned meaning of "end" in terms of "the perfecting what was begun" and not as a replacement of the old world that would follow its literal destruction, leading to the establishment of a human vision of Utopia. In short, Christian cosmic eschatology affirms a process of building the Kingdom of God that depends on God’s initiative starting with the Second Coming of Christ also described by the early Christians as the Parousia, the imminent coming of the Lord. Christians in the first century C.E. believed the end of the world would come during their lifetime, but Jesus already stated that no one but God knows when it will happen. When the converts of Paul in Thessalonica were persecuted by the Roman Empire, they believed the end was upon them. However, by the third century, most Christians believed the End was beyond their own lifetime; Jesus, it was believed, had denounced attempts to divine the future, to know the "times and seasons," and such attempts to predict the future were discouraged. After 500 C.E., the importance of the End as a part of Christianity was marginalized, though it continues to be stressed during the season of Advent. Karl Barth evaluated the importance of Christian eschatology throughout the centuries of the development of Christian doctrine and arrived at the conclusion that “Eschatology became a harmless little chapter at the conclusion of a Christian dogmatics.” However, all that changed at the beginning of the twentieth century. It started with Albert Schweitzer, who defended a Thoroughgoing Eschatology by affirming that Jesus was an eschatological preacher who expected an imminent end of history. Later, Rudolf Bultmann outlined his Existential Eschatology with his program of "demythologizing" Biblical eschatology, and Juergen Moltmann developed the Theology of Hope putting the Christian eschatological vision at the center of his interpretation of the Christian message. By the late 1950s, eschatology had become the storm center of Christian theology. Some current Christians place the end of the world within their lifetime or shortly thereafter. Their convictions can sometimes be placed on the prolific telling of tragedies all around the world each day on the news, combined with interpretations of scriptures in the Bible. Also, some Catholics believed that the third part of the Fatima message, which was to be disclosed by the Vatican in 1960, but finally was published under the pontificate of John Paul II, was a prophetic message from the Blessed Mother about the end times. In conclusion, one can say that, based on the New Testament writings, Christian eschatology began already with the Christ event, however, it also announces several events to take place in the future: The Second Coming of Christ, the final judgment by fire, resurrection, eternal life in an imperishable spiritual body, the wiping away of all tears so that at the time of final eschatological fulfillment after the victory over all evil, God would be all in all (1 Cor.15:28) leading human beings and all creation to the completion of its original God given purpose. Islamic teachings about humanity’s final destiny developed on the foundation of Judaism and Christianity. In particular, Islamic individual eschatology focuses on everlasting punishments and rewards that take into account an explicit concept of the responsible self. The Qu'ran also includes teachings about cosmic eschatology with its emphasis on the coming Day of Judgment and the resurrection of the dead. By way of emphasizing human responsibility for developing one’s own unique individuality, Muslims also affirm the need for human freedom. Even if the soul’s freedom stands in tension with Allah’s omnipotence, still it is a necessary condition for human beings to be endowed with freedom and responsibility in order to make genuine moral decisions. The Qu'ran tells us:” Whoever gets to himself a sin gets it solely on his own responsibility… Whoever goes astray, he himself bears the whole responsibility of wandering (4:111, 10:103). Depending on its earthly conduct, the soul faces its individual judgment and is assigned to either the heavens or the hells that are described in the Qu'ran in great detail with vivid images. Because of such explicit accounts of the afterlife, it seems that most Muslims believe these heavens and hells to be actual locations. The reason for describing these places of reward and punishment in such elaborate ways is explicitly mentioned in the Koran: “That the hearts of those who do not believe in the Hereafter may incline to it” (6:113). The question arises why human beings would not believe in the Hereafter, commit acts against Allah’s will or go astray? Parallel to Jewish and Christian scriptures, the Qu'ran speaks about the Fall of Adam and Eve and their alienation from Allah (Surahs 2, 7 and 20). Even if the rebellious angel Iblis (the counterpart to the fallen angel Satan in the Hebrew Bible) is permitted to tempt whomever he wishes until the Last Day (7:18), still the results of the Fall seem to be not as devastating as Christians would believe on account of their doctrine of Original Sin. That is to say, Muslims in their daily life of faith focus more on fitra, their original human nature in its God given purity and goodness, while accounting for their separation from Allah as caused by the Fall through the notion of ghaflah, a forgetting of one’s divine origin. It is the believer’s task in this earthly life to break this habit of forgetfulness and to affirm a healthy self image that is rooted in Allah’s original endowments (Smith, 239). How successful Muslims fulfill that task will then determine their individual destiny in the afterlife. Reading the Koran, with its intense language of contrasting heaven and hell, allows the believer to overcome any spiritual indifference as caused by the forgetful attitude of ghaflah. For Islam, the central doctrine for cosmic eschatology is the Last Judgment. Both, the individual and the cosmic dimension of eschatology are rooted in the understanding of Allah who is the Allah of justice and righteousness. In the Last Days, his decrees will be carried out with absolute certainty, in particular the separation of the righteous from the unrighteous through the resurrection of the dead and the Last Judgment. Similar to the Jewish and Christian scriptures, the Qu'ran speaks of the signs of the Last Days in terms of calamities and suffering, that announce a time when human defenses are torn down and “every soul shall know what it has done” (Surah 81). The measuring rod for the Last Judgment is again personal accountability for all actions during one’s earthly life. As Jews and Christians expect the fulfillment of eschatological hope through the coming of the Messiah, also Muslims believe that the Last Days begin with the arrival of a savior figure, who will inaugurate the Last Judgment. For the Sunnis (constituting the majority of "traditionalists"), it is the Mahdi who comes at some future time to establish Allah’s rule on earth. The Shiites (the minority of the "partisans" of Ali, Muhammad’s son in law) believe that this expected Mahdi will be the long awaited Hidden Imam. The identity of the Hidden Imam goes back to the ninth century C.E., when Muhammad, the son of Imam Has an al-Asker of Iraq, miraculously vanished after the death of his father. Shiites believe that this vanished son who received the mission of the Mahdi still lives in concealment and will reappear in the Last Days. One source, Mohammed Ali Ibn Zubair Ali's Signs of Qiyamah, discusses the arrival of the Enlightened One, Imam Madhi, followed by natural disaster, "The ground will cave in, fog or smoke will cover the skies for forty days. A night three nights long will follow the fog. After the night of three nights, the sun will rise in the west. The Beast of Earth shall emerge. The beast will talk to people and mark the faces of people…." The Qu'ran will be lifted from the hearts of the people. The "Imam…will create a world state… He will teach you simple living and high thinking. With such a start he will establish an empire of Allah in this world. He will be the final demonstration and proof of Allah's merciful wish to acquaint man with the right ways of life." The major religious traditions of the world share several themes in their teachings on eschatology. The common belief in a life after death raises questions about the destiny of human beings, thus leading to doctrines of individual eschatology. One major teaching shared by most religious traditions concerns the condition of life after physical death, a condition that is understood to be dependent on the quality of life on earth. This implies that the correlation between the spiritual and physical lives is grounded in a universally accepted moral order. The other major eschatological theme shared by the world’s religions concerns the common destiny of humankind and a new world order, issues that are treated in a body of doctrines known as cosmic or universal eschatology. Religious traditions that hold a cyclical view of history understand concepts of eschatological fulfillment within an ongoing cosmic cycle of generation and destruction. In short, visions of a perfected society in the future are limited to distinct ages within an overarching cyclical framework of reality. Contrasting this position is the linear view of history that is shared by Zoroastrianism and the Abrahamic faiths. Eschatological fulfillment is here perceived as the working out of an original potential of goodness that indwells all of creation. In other words, the scriptures in these traditions reveal God’s sovereignty as existing within the order of a divine purpose. The "end of the world" now becomes the fulfillment of what was begun. Human beings, through accomplishing their share of responsibility, respond to their divine calling and become agents in leading creation to the attainment of God’s original purpose. ↑ Willard G. Oxtoby, World Religions: Eastern Traditions (New York : Oxford University Press, 2002), p. 45. ↑ Smith, Huston. The World’s Religions. (San Francisco : Harper, 1991), p. 240. Braaten, Carl E., and Robert W. Jenson (eds.). The Last Things: Biblical and Theological Perspectives on Eschatology. Wm. B. Eerdmans Publishing Company, 2003. ISBN 978-0802848789. Kelly, Anthony. Eschatology And Hope (Theology in Global Perspective). Orbis Books, 2006. ISBN 978-1570756511. Kim, Young Oon. World Religions: Living Religions of the Middle East. New York: Golden Gate, 1976. Owen, H.P. "Eschatology." In Paul Edwards, Ed. The Encyclopaedia of Philosophy. New York: Mac Millan, 1967. Oxtoby, Willard G. World Religions: Eastern Traditions. New York: Oxford University Press, 2001. ISBN 978-0195415216. Schwarz, Hans. Eschatology. Wm. B. Eerdmans Publishing Company, 2001. ISBN 978-0802847331. Smith, Huston. The World’s Religions: Our Great Wisdom Traditions. San Francisco: Harper, 1991. ISBN 978-0062508119. This page was last modified on 5 November 2008, at 18:42.